Look. We know that you know that we know there are tons of affordable studio reference monitors out there, each claiming to “raise the bar” on the other. The MRmk2 value proposition is simple. As a professional studio monitoring solution, MRmk2s are extremely balanced, outputting high-frequency clarity and midrange definition you can stake your reputation on. Furthermore, they out-power any competitively-priced monitor solution and deliver deeper, more accurate bass than anything in their class. Perfect for professional and home studios, as well as home theaters and multimedia applications, MRmk2 monitors deliver a rich sonic experience and the power, performance and clarity you need to create world-class mixes. 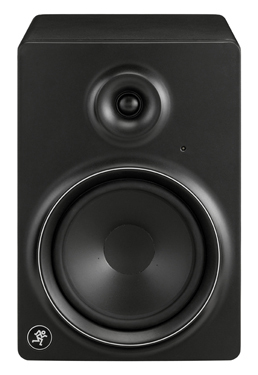 MRmk2 Series studio monitors feature all-new professional transducers specifically designed to meet the demands of the modern project studio. The neodymium magnet-driven silk dome tweeter is both smooth and accurate, featuring ferro-fluid cooling to help protect against power compression during wide dynamic playback. Meanwhile, the hyperbolic curved cone woofer, inverted dust cap and long voice coil winding work in tandem to deliver smooth, consistent output with controlled low frequency performance. When paired with our precision-tuned amplifiers, MRmk2 monitors provide spot-on input-to-output tuning that you can take to the bank. The dual precision Class A/B amplifiers have been re-voiced to specifically match their new driver components, ensuring that your sound is minimally impacted by distortion, artifacts or changes in frequency response often imparted by working at a variety of volume levels. MRmk2 Series monitors are a 2-way design that offers up to 150 watts of total system power. Delivering more power than anything in their class, MRmk2 studio monitors provide exceedingly smooth output, from ultra-low bass frequencies to precise midrange and sparkling highs. An optimally-sized custom waveguide is designed to maximize sonic clarity and dispersion, while also serving to minimize diffractions. This approach allows for seamless transition of HF and LF content along with a 3-dimensional sense of space. MRmk2 monitors also feature a molded baffle to impart superior imaging and depth. Your monitors need to be as accurate as they are great-sounding, and the MRmk2 design philosophy gives you exactly that. Much more than sleek-looking, MRmk2 cabinets also feature custom-tuned rear ports, allowing for the controlled passage of air in and out. Plus, the cabinet is constructed of solid MDF, so there’s no unwanted distortion from air movement or vibrations. Transducers are never restricted by pressure, and the cabinets resonate low for deep, balanced bass. We know studios can be expensive to set up, which is why everything even down to the cabinet design of MRmk2s is handled with the utmost attention to detail. *Note: The MR8mk2 does not support multiple voltage configurations. Make sure the voltage rating for your particular model (as indicated on the rear panel near the IEC socket) corresponds with your local AC mains voltage.